Designed as a portable and affordable entry level to a mid-level computerized telescope, Celestron NexStar 130 SLT Computerized Telescope looks like being taken out of some sci-fi movie. Even SLT is the acronym for Star Locating Telescope. The very name of this telescope is a reiteration of the model’s purpose and power to locate stars and celestial objects. Celestron NexStar 130 SLT is part of Celestron’s Nexstar SLT Computerized Telescopes series, a family comprising more than seven models with different apertures, which start from 60mm (Celestron NexStar 60 SLT Computerized Telescope), and going up to 130 (Celestron NexStar 130 SLT Computerized Telescope). The 130mm model (not to be confounded with the 127mm model) is the best of the best, or at least it is the smartest, definitely the best choice for a beginner to intermediate astronomer. Even if you’re not quite there yet but plan to continue your astronomy journey, this telescope is a good choice because it’s a great and solid semi-professional tool. 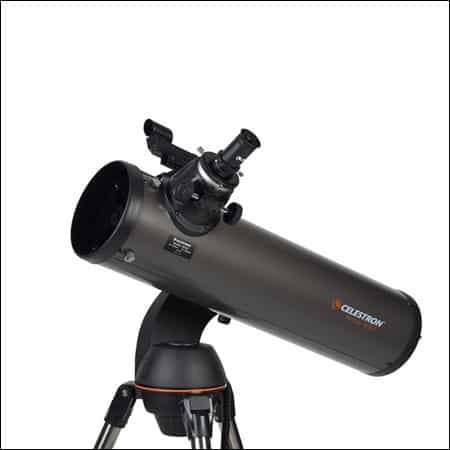 This Celestron NexStar 130 SLT Computerized Telescope can then be used as a base to which you can add upgrades and more advanced telescope accessories later, as your knowledge and astronomy needs progress. Celestron’s computerized telescopes offer the possibly to automatically align the scope with the help of a rather simple remote control. Besides the fact that it’s an amazing idea, this small detail makes even an entry-level astronomer to be able to find the most important celestial bodies, accelerating the learning process. Critics say that this type of telescope will only make people lazier and less interested to find out how to locate stars and planets, or how they like to say less interested in the real astronomy, but this is rather an exaggeration. People usually learn by doing and with this telescope, its users will definitely have a lot to discover and to learn. What is the Celestron NexStar 130 SLT Computerized Telescope? Celestron NexStar 130 SLT Computerized Telescope is an amazing scope for all beginner and intermediate astronomers. The main characteristic of this telescope is the fully computerized mount (Altazimuth type of mount) and the StarPointer finderscope, meaning that by simply introducing the date, the time and the location, this scope will automatically turn to the closest and brightest celestial body in the sky. This is a Newtonian telescope which makes everything look so nice and easy. Besides that, this one of those scopes that make you fall in love from the first use. Just try it once and you’ll get hooked forever and ever. 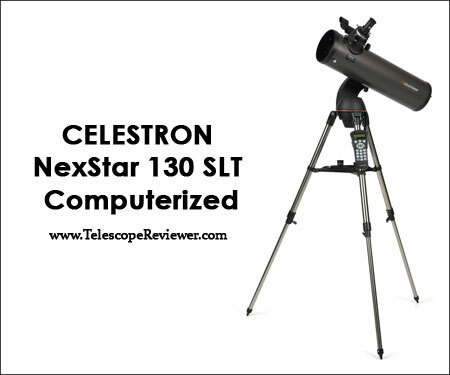 The Celestron NexStar 130 SLT Computerized Telescope uses a 130mm, 650mm focal length Newtonian optical tube assembly. As in the case of all Newtonian telescopes, you may need to align it. Usually, the brand new telescopes come aligned or collimated, but if this is not the case for your scope, you will have to start the collimation all by yourself. Don’t worry, collimating your scope is not rocket science. Just look for Celestron NexStar 130 SLT Computerized Telescope on YouTube and you will find a multitude of helpful videos. To get the telescope working, you will need 8AA batteries, but the scope can be plugged in and you can continue long after the batteries are gone. 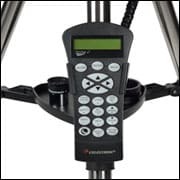 A rather low-cost beginner scope collection, NexStar’s series was designed to be ergonomically perfect and very easy to use. If you are not really such a technical-savvy person, you can switch to hand control in no time and without any problem whatsoever. The computerized part allows you to select a celestial object, change the speed of the gear, view information of an object, and all that with at the touch of a button. One of Celestron’s best beginner telescopes, this telescope will surely make your interest in astronomy grow sky-high. It was designed as an affordable entry level telescope that can be set and used in a matter of minutes, but it can be successfully used by an advanced mid-entry level astronomer. The telescope is compatible with 2 inches pieces, making it quite versatile. Good eyepieces – this scope includes a great pair of eyepieces of 25 mm (26x magnification) and 9mm (72x magnification). In time, you will maybe need to purchase some Barlow lens, just to increase the magnification and upgrade it to an intermediate level. 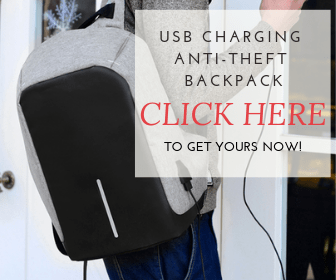 Portability – the tube and the tripod are quite light. This scope is bigger than the majority of other portable telescopes, but it will still fit the back of a normal car. The scope comes with a steel tripod, making the telescope more stable. Still, if you want to use it in a windy day, you will need to find something to balance it. The Celestron NexStar 130 SLT Computerized Telescope astrophotography uses are quite valuable for such a low-priced scope. The photos you can capture with a computerized scope of this quality will be breathtakingly beautiful and clear. Some consumer reports have complained of receiving a faulty secondary mirror – apparently, you should better check it, immediately after receiving your telescope. If the mirror is damaged or less than functional, the Celestron customer support will replace it for you. No date and place memory – the piece doesn’t retain the time and the place, which can turn into a hassle if you don’t change your observation point. If you only use the telescope from a single observation point, you will need to enter the date and the time each and every time you want to use it. Where to Find the Celestron NexStar 130 SLT Computerized Telescope? The standard price on Amazon is somewhere around $400 – $500 and FREE shipping. Still, there are many reductions that apply to the original price. For example, we purchased our piece from Amazon with just a little over $400 and everything was great. We strongly insist that you buy a new telescope from a trustworthy place, be that a shop or a website. Being a rather fragile piece, you may want to invest a bit more and to have your brand new telescope from a place that will give the certitude that everything will be delivered just fine. Maintenance is rather regular. Nothing special when it comes to cleaning this telescope. Take care of your optics and clean them only when necessary. If dust has built up on the optics, remove it with a specialized brush (made of camel’s hair) or with some pressurized air. Do not use industrial cleaning solutions, as these may contain alcohol or any other substances that may destroy the lens. Apply some optical cleaning solution on a very soft piece of cloth and remove any debris left from center to the outer portion. DO NOT RUB IN CIRCLES! Minimize the risk of contamination and thus the need to clean your scope by applying the lens covers as soon as you are done with using the telescope. 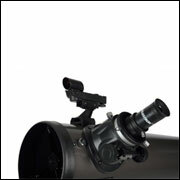 Being a Newtonian Telescope, the Celestron NexStar 130 SLT Computerized telescope will need to be collimated once in a while, but you can find all the information about collimation either in the telescope’s manual or online. Usually, telescopes come already collimated, so you will need to do this procedure only months after starting to use it, depending on the way of using it. Celestron has a Newtonian Collimation Tool, which can be purchased online (price starting from $26.99). Also, you will find a variety of videos on how to collimate your Celestron NexStar 130 SLT. You will also find the whole collimation procedure in the telescope’s manual. The first time it will be quite difficult, but don’t worry, it won’t be that bad. 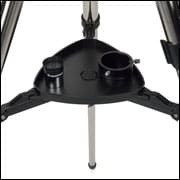 When purchased, the Celestron NexStar 130 SLT Computerized Telescope comes with a steel tripod with a plastic accessory tray where you can leave all your small pieces. The pack also includes 2 eyepieces: one of 25 mm (26x magnification) and 9mm (72x magnification). Sometimes, depending where you purchase your scope from, you may receive a finderscope, but if this valuable piece is not included, we strongly advise you to purchase it. The telescope comes with a CD with TheSkyX – First Light Edition astronomy software with a remarkable object database, printable sky maps, and 75 enhanced images. Celestron offers a reliable MobileApp that features all stars and planets, as well as maps. This is a good low-cost telescope. We strongly advise you to purchase it for yourself or for some astronomy enthusiast friends. Just have a bit of patience with it, take your time and you can definitely become a pro in astronomy. The Celestron NexStar 130 SLT Computerized Telescope is quite portable and light-weighted (less than 2lbs), but still, you may want to purchase a Celestron Nexstar Soft Case (prices starting from $28.95 on Amazon) to take it with you to the observation point. This telescope is an amazing asset for everyone, no matter the age or the level of previous astronomy training, so we wholeheartedly recommend it.